Gandhi’s ideas in regard to this New Education did not, of course, suddenly emerge in 1937, but –were the outcome of long years of sustained thought and experience. 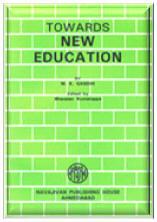 The present book relates to this earlier formative period when he revolted against the prevailing system of education and sought in various ways to substitute it by educational practices more in harmony with his own conception of the function of education. To understand adequately the Basic Education schemes which lie formulated in 1937 it is essential to go back to this earlier period where we can see it in origin and growth. The present book may, therefore, be said to be a necessary companion volume to the one on Basic Education.